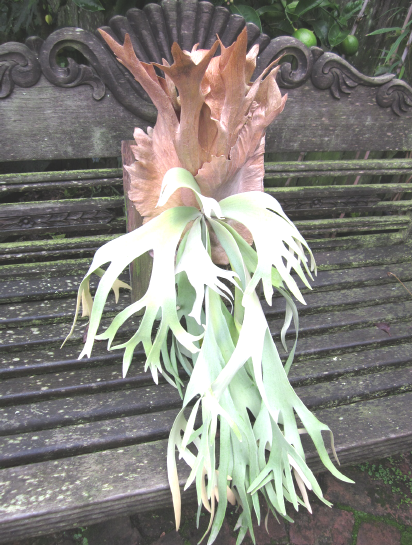 Platycerium willinckii (wil-lin-key-eye) sometimes called Java Staghorn. Native to Java and the Lesser Sunda Islands. Closely related to P. bifurcatum but the shield fronds are different by being very tall and deeply lobed. They quickly turn brown and as they decay a mesh of veins is left standing as pictured right. 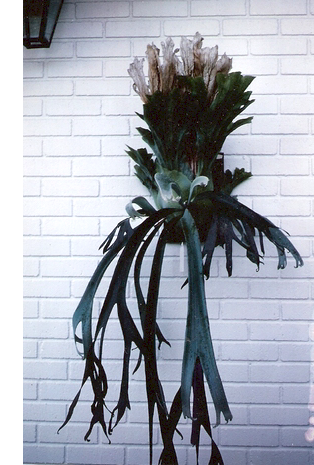 The fertile fronds grow edgewise at the bud and then flatten and hang down. Many P. willinckii have about 12 fertile fronds growing from the bud. They have more hair on the underside of the fertile fronds. The white hair shields it from high heat and water loss. 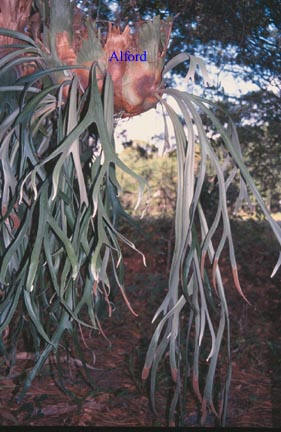 With the whitish hair, the fertile fronds provide a stark contrast between the brown shield fronds and the green fertile fronds. Some P. willinckii develop a wide, flat group of pointed, curved fingers at the ends of the fertile fronds (see cv Weeks below). Those with very long fertile fronds are possibly the extreme form of the natural population, but they are also the most distinctive for the hobbyist. The fertile frond length is affected somewhat by its environment and how many are allowed to develop. The bud of P. willinckii is rather small. This species may remain inactive for quite some time after being shipped, and the small bud is apt to cause the new owner to consider the plant dead. This platy is easy to grow and offers no specific problems. It forms pups, but not as freely as P. bifurcatum. It does well in medium light, moist moss, and is not prone to rot. It cannot be expected to grow as quickly as, or take temperatures as low as P. bifurcatum. Reports from Thailand suggest rot is a problem for them and this is a difficult plant to grow which is the reverse of So. California where they tend to thrive. Plants in the American trade are grown from pups. It is almost never imported now, or grown from spore. However Thailand reports, growing from spore may be best? The spore of P. willinckii is green which is an indication they do not live long. They germinate quickly producing sporelings under very moist conditions. The P. willinckii cv Weeks on the left is from the former Hawaii Staghorns Nursery and nurseryman Ron Weeks in Miami FL. When the unique curling characteristics were observed, it was named after Ron Weeks. The P. willinckii cv Weeks has a habit of curling the tips of the fertile fronds. Recent observations show the tips of the fertile fronds are thin and narrow. 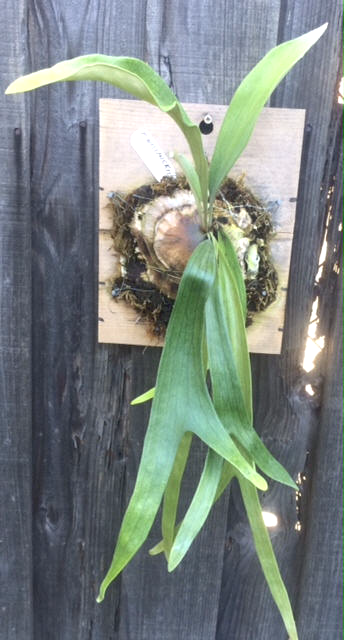 As the spore patch grows, it expands on the underside causing the tips to curl in a distorted manor as seen in photo on right. We have not seen this characteristic on any other species. 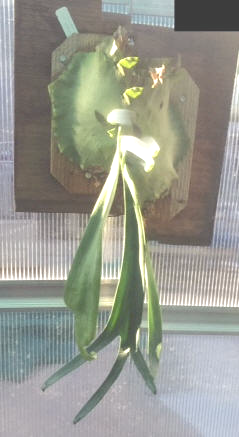 It almost appears as if the plant is stressed, but that is not the case. It is probably because the fertile fronds are thin and flexible allowing the expanding sporangia to cause the fertile frond to curl. 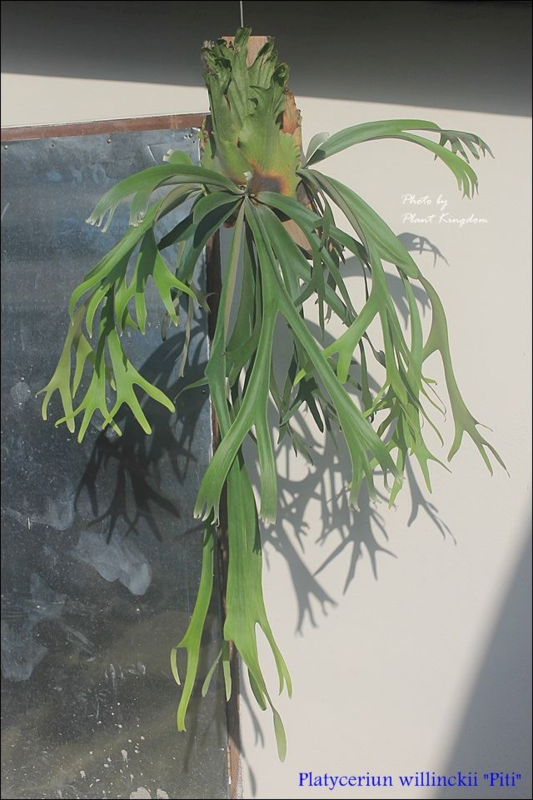 Charles Alford of Rareferns.com grows many P. willinckii in Florida and his web site illustrates how the fertile fronds grow up until they mature then drop down and may become quite long. They are long strap-like fronds for most of their length then divide. He also states the fronds can vary from broad to narrow. These two photos of Alford's are of P. willinckii 'Little Will' and he feels it is probably a willinckii. Charles Alford states this is an interesting platy and I have to agree it is unique. It makes lots of small plants, but seldom makes shields. He feels it is often ratty, but can be interesting, covering a plaque or basket. In these pictures, the top fronds are broad and short. Below are long strap-like fronds. No shield frond appears to be present and there are no comments on spore patches, suggesting the short broad fronds may not be fertile and are a new variation of the typical shield fronds. The right photo shows how small the established plant stays. The small size supports the idea that it can not tolerate low temperatures. The picture on the right is from Don Callard's collection in San Diego. Don obtained this from Charles Alford in Florida. It displays several small plants grouped close together with several growing buds. There are no shield fronds and no spore patches. Is this a sterile cultivar that only volunteers pups? Two young platys from my collection. The one on the left is P. willinckii 'Pygmaean' and on the right is P. willinckii 'Java'. The Java is supposed to represent what grows in nature, we shall see. The P. Willinckii 'Java' on left shows three unique traits of the "Java" form. First notice how the new fertile fronds are growing out edgewise before tuning horizontal as they get larger. Second, notice how the shield fronds turn brown providing great contrast between the fertile and shield fronds. Third is a trait that I have never seen before except of the cultivar "Java". The tops of the shield fronds curve outward rather than standing tall. The shield fronds bend outward in a horizontal manor. At first I thought this might be a product of poor handling. But a new set of shield fronds have grown the next season and they are bent outward. I have also confirmed this trait with Don Callard in San Dieigo who also has a P. wilinckii 'Java". This characteristic appears to have continued thru several generations, it should be considered typical of this cultivar. 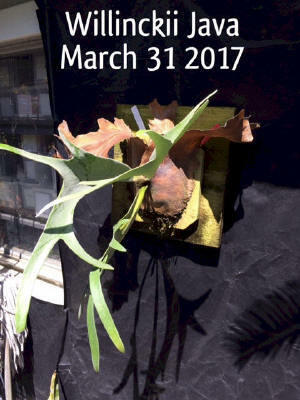 The Platycerium willinckii 'Schofield' (right) is documented in Wendy Franks book, but not Roy Vail's or Barbra Joe Hoshizaki's books. Longwood Gardens also claims to have one. It is named after a former grower Glen Schofield. This cultivar has very long and deeply lobed fertile fronds. 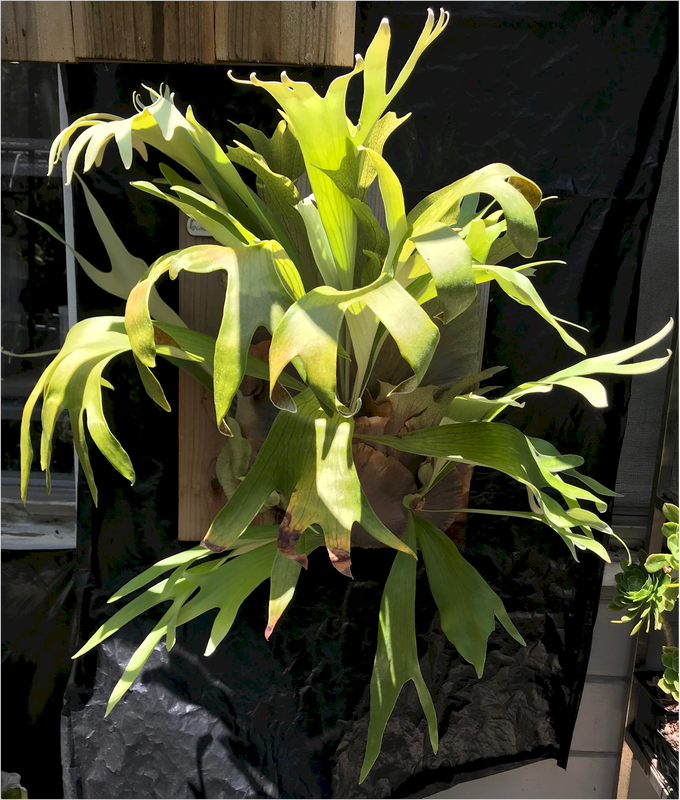 We just picked one up from Larry McCullah, long time member of the Los Angeles International fern Society and the length of the fertile fronds must be 48 inches. We had to divide it up to move it and I was given one of the pups. I mounted it on a large 18x24 inch redwood board. 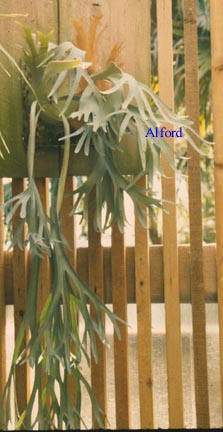 The fertile fronds are 48 inches long and grow edgewise from the bud, hang down, and appear ratty. Although the tips do not curl like cv 'Weeks". The spore patch is about 7 inches long on the tips and extends to the tip. 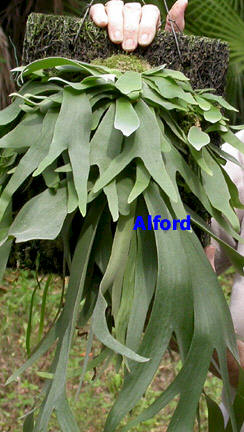 A younger frond on the same plant has spore patches of only 1 inch and do not extend to the tip. This cultivar is a collectors pride. 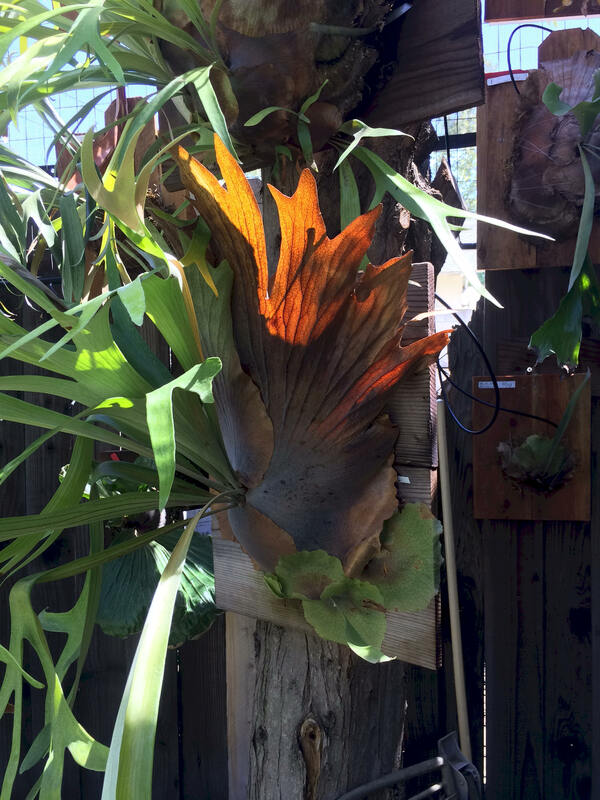 The photo on the right is the same plang with the sun shining on the shield frond illustrating the rich redish brown colors in the shield frond as it ages. 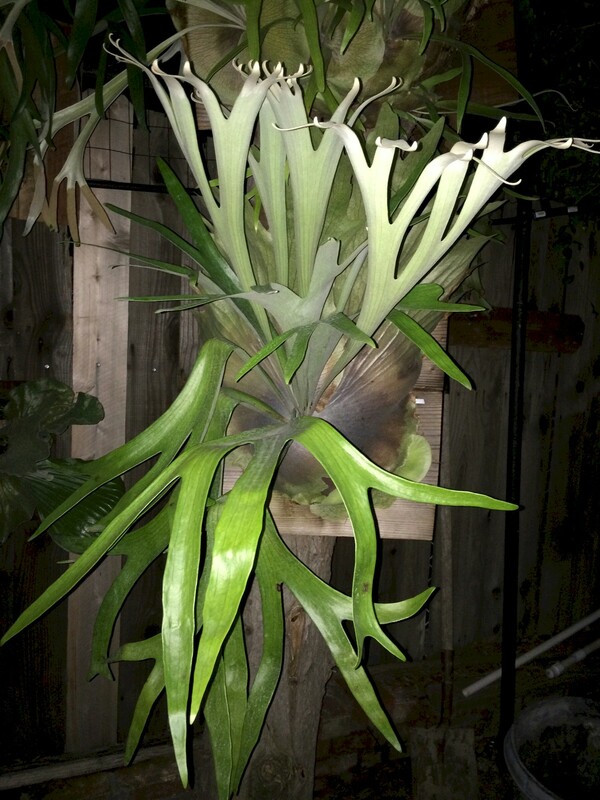 This photo is of a P. willinckii 'Fairchilds Tropical Garden' which is part of Tom Gauci's collection in Huntington Beach. 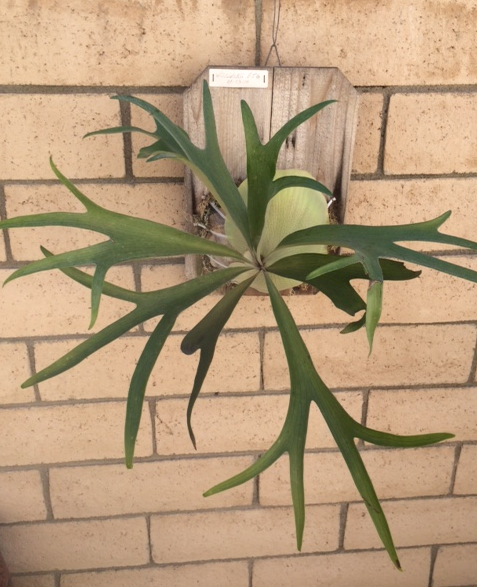 It is a young plant with narrow strap like fertile fronds that fork once, then fork a second time. 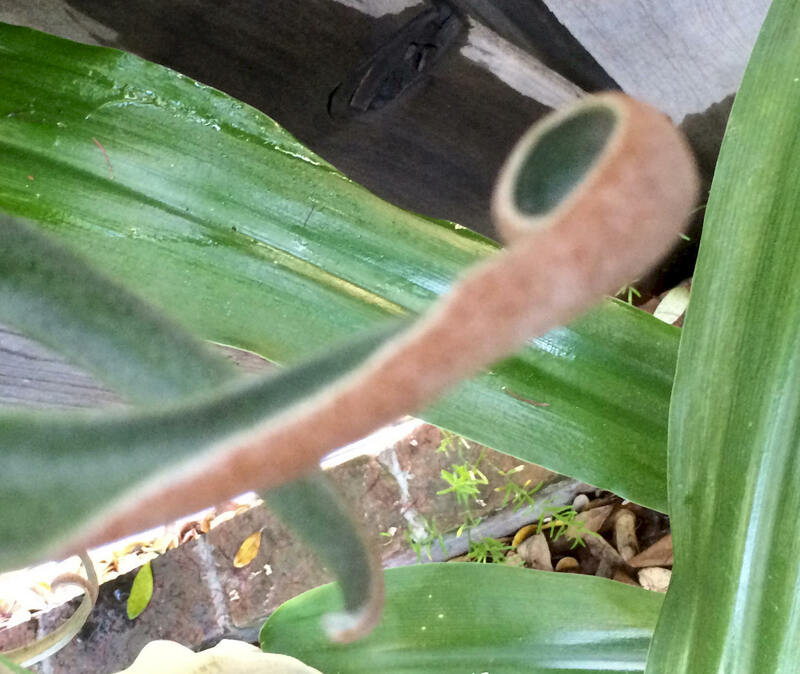 The shield frond has not formed deep lobes yet. At this stage the shield fronds resembles a P. hillii. 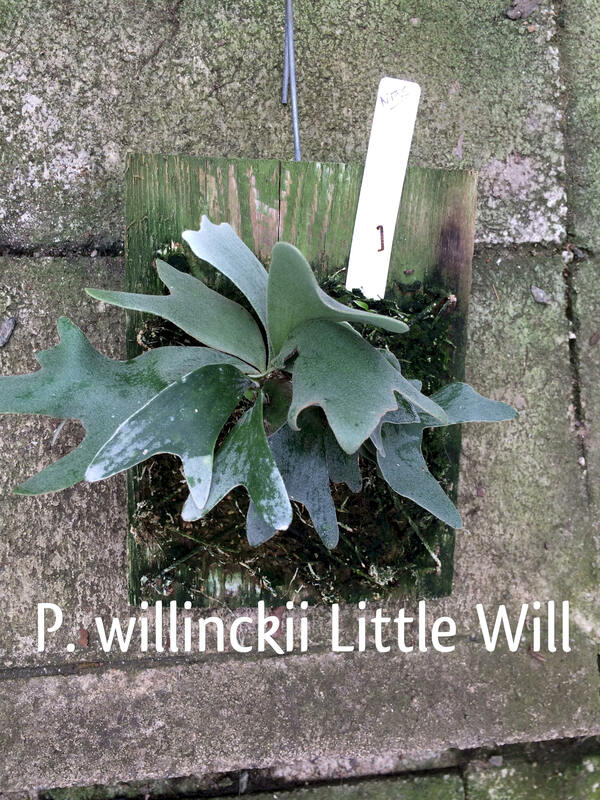 The Platycerium willinckii 'Piti' is featured on Facebook, Planet Paltycerium, and a new cultivar to this writer. Little is known about this cultivar. From the large number of fertile fronds, this appears to be in the P. willinckii. The shield fronds have not turned brown and the color is still a dark green. I don't know why this is considered a unique culltivar.